Read our early impressions in our Surface Laptop first take. In an unusual twist for Microsoft’s hardware reveals, its newest Surface product, the Surface Laptop, was leaked the night before the company’s May 2 education-focused event. 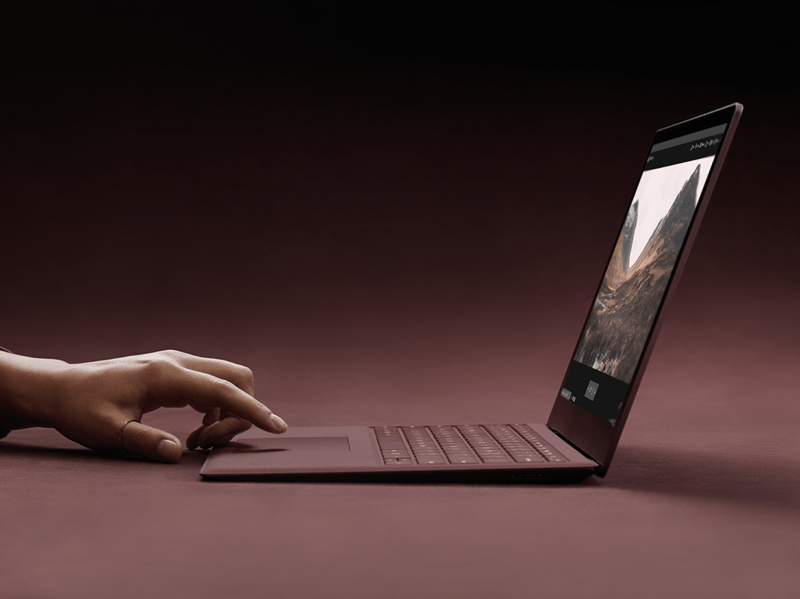 While most of the surprise was therefore lost, Microsoft still managed to create a little excitement with its introduction of the new Surface Laptop. As rumored, the new machine is the first in the Surface line to function as a simple clamshell notebook. Nevertheless, the Surface Laptop supports the Surface Pen and Surface Dial, and so can provide some of the extra convenience both afford, along with the ability to support Windows 10 Ink. As with the other members of the Surface line, the it offers a 3:2 ratio PixelSense display with a 13.5-inch Gorilla Glass 3 panel supporting 3.4 million pixels. Microsoft brags that the display is the thinnest LCD touchscreen available today on a notebook. Microsoft announced the Surface Laptop alongside the new Windows 10 S that’s aimed at the education market, but the hardware doesn’t quite follow the same low-cost mentality. The Surface Laptop will start out at $999 for an unspecified configuration — Microsoft is clearly leaving it to its manufacturing partners to produce low-cost Windows 10 S machines for the classroom. The Surface Laptop will ship with Windows 10 S, and Microsoft is offering a free upgrade to Windows 10 Pro for a limited time. 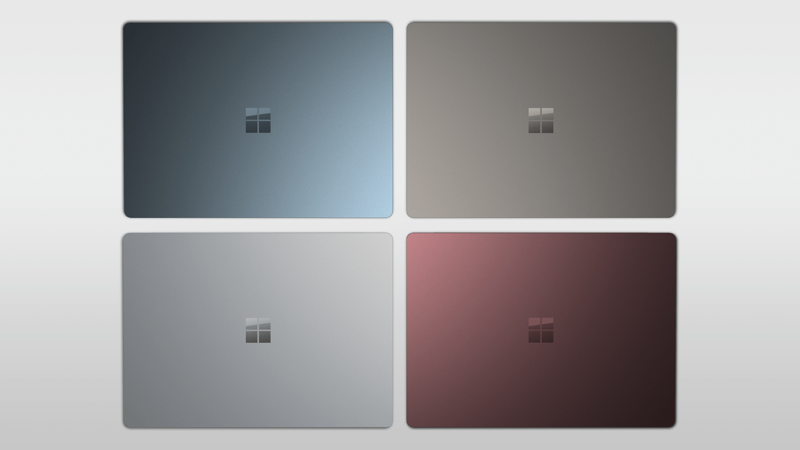 Microsoft is offering four colors for the Surface Laptop: Platinum, Graphite Gold, Cobalt Blue, and Burgundy. The color scheme will apply to the all-metal chassis as well as the cloth-covered keyboard deck. In terms of specifications, the Surface Laptop will support seventh-generation Intel Core i5 and i7 processors, and up to 1TB SSD using NVMe technology. In spite of the high-end components, Microsoft estimates battery life at up to 14.5 hours. The company is aiming the Surface Laptop directly at the Apple MacBook line, perhaps the most popular of the extremely thin and light notebooks used in higher education today, and Microsoft highlighted the better performance and battery life of the Surface Laptop. In terms of build, the Surface Laptop offers a tapered design, moving from 14.47mm at the rear to 9.9mm in the front. It weighs 2.76 pounds. The keyboard base uses the Alcantara material used in the company’s high-end Surface Pro 4 Type Cover, and the backlit keyboard offers 1.5mm key travel for a comfortable feel. The speakers are located underneath the keyboard at the front of the device, and utilize unique technology to radiate the sound through the cloth for an immersive experience. Connectivity is limited to a single USB Type-A port, a DisplayPort, and the standard Surface connection — surprisingly, there’s no USB Type-C port in sight. More details will come at some point, but for now we know that Microsoft is taking pre-orders starting May 2 with delivery starting on June 15. At $999, the Surface Laptop offers a thin and light machine that’s optimized for Windows 10 and that competes directly with Apple’s MacBook while maintaining the Surface design aesthetic. Updated on 05-02-2017 by Mark Coppock: Added additional details and updated images.